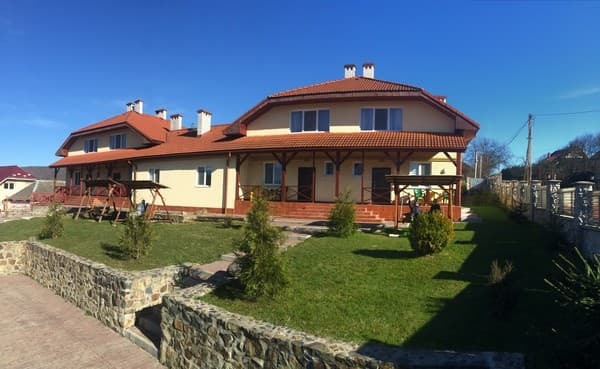 Cottage "Panorama of the Carpathians" is located in Svalyava district of the Transcarpathian region, in the resort village of Polyana, 200 m from the largest in Ukraine balneological sanatorium "Sunny Transcarpathia". The cottage complex is surrounded on all sides by a mixed forest, which makes the air particularly clean and healing, full of phytoncides and air ions. In the forest there are designated health resort routes for therapeutic walking. At guests' disposal - stylish two-storey apartments, equipped with new furniture and necessary appliances. 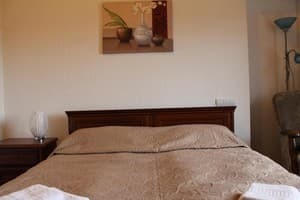 Description of the room: On the ground floor there is an entrance hall, a toilet, an equipped kitchen, a spacious dining room with a dining table, a large living room with soft unfolding furniture, a TV. Description of the room: Two-storey four-room apartment with a separate entrance, where you can comfortably accommodate from 2 to 7 people. The total area of ​​each apartment is 130 m². 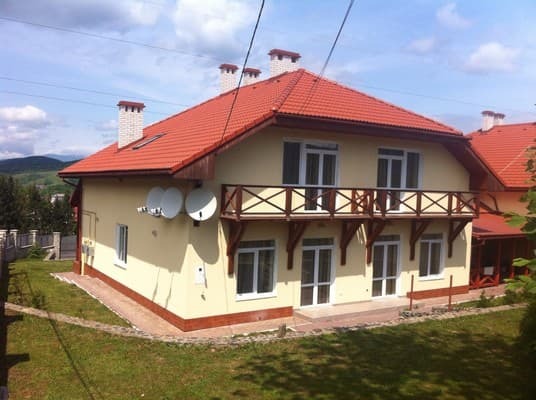 On the first floor of the apartments there is an entrance hall, toilet, equipped kitchen (gas cooker, microwave, refrigerator, kettle, toaster, dishes), spacious dining room with dining table, large living room with soft furniture, TV. On the second floor there are two spacious bedrooms (24 m² and 17 m²) with double beds, a wardrobe, a chest of drawers and a TV. It is possible to provide additional space for the child. One of the bedrooms is equipped with a balcony. On the second floor there is also a bathroom with a shower, a toilet, a bidet, a washbasin and a washing machine. Additional place 150 UAH (sofa). 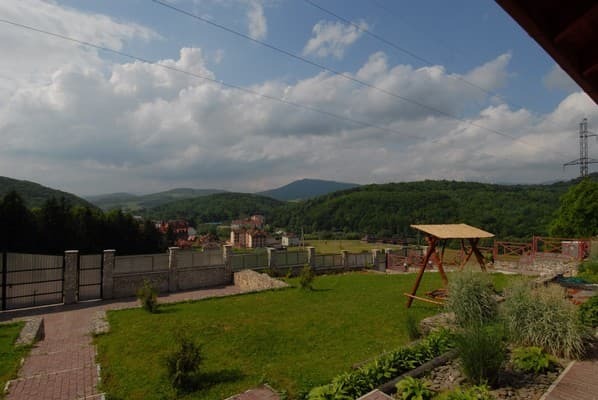 The town house "Panorama of the Carpathians" has a kitchen for self-cooking. 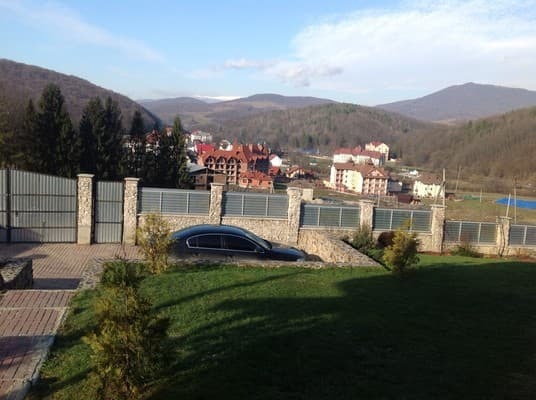 The nearest restaurant, cafe, koliba 150-200m. 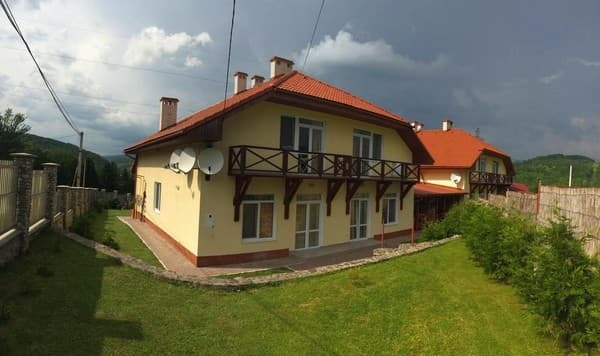 The cottage "Panorama of the Carpathians" is located 200 meters from the sanatorium "Solnechnoe Zakarpattya". 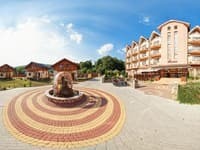 Sanatorium "Sunny Transcarpathia" is the largest balneological gastroenterological resort. The main wealth of the sanatorium is carbonic hydrocarbonate sodium mineral water, containing biologically active microelements of boron and fluorine. By train - to the station Svaliava (direction to Uzhgorod), the transfer from the station is possible. By car - Kyiv-Lviv-Chop highway (M-06), turn right after the sign to Svalyava, and drive to Polyana village.